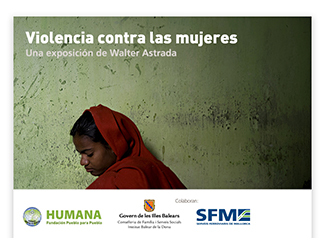 On Thursday, 12th, February Humana presented in Palma de Mallorca the exhibition "Violence against women", by the photojournalist Walter Astrada, three times winner of the prestigious World Press Photo. The show, which has the support of the Institut Balear de la Dona and Ferroviaris Serveis de Mallorca, will be displayed in the lobby of the -2 floor of the Palma Intermodal Station (Plaça d'Espanya, s / n) from 12 to 27, February. On Thursday February 12 at 12:00 pm in the lobby itself -2 Palma Intermodal Station plant, the opening ceremony of the exhibition will be held with the participation of Ms. Isabel Llinàs, director of the Institut Balear Donut (IBD) and Walter Astrada.